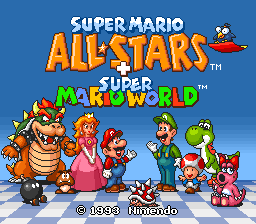 Color fix and the “SUPER MARIO WORLD” subtitle removed. 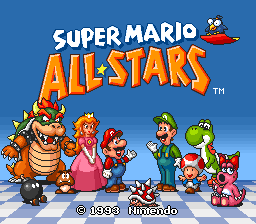 Color fix and the original logo graphics restored. View README.txt for the patch version history and other patching information. 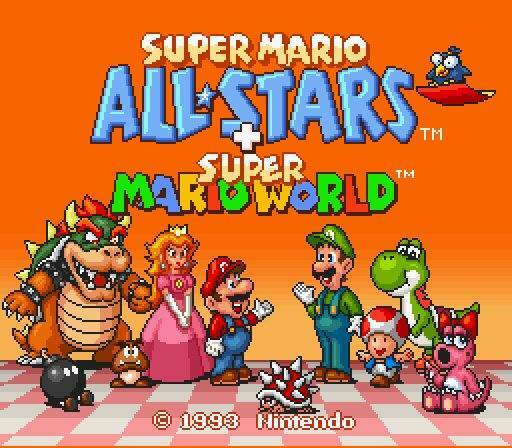 This is one of my favorite combo carts, but jeez that orange-and-pink title screen was UGLY! This one reverts it back to that original, pleasing baby blue. So much better. 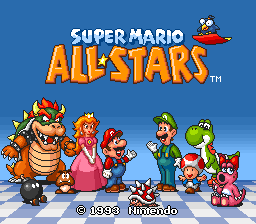 And with the logo mod, it reverse Super Mario All-Stars into a single title, so that it’s five games under a single unified banner. This feels the way it should have always been. Now this collection is perfect.